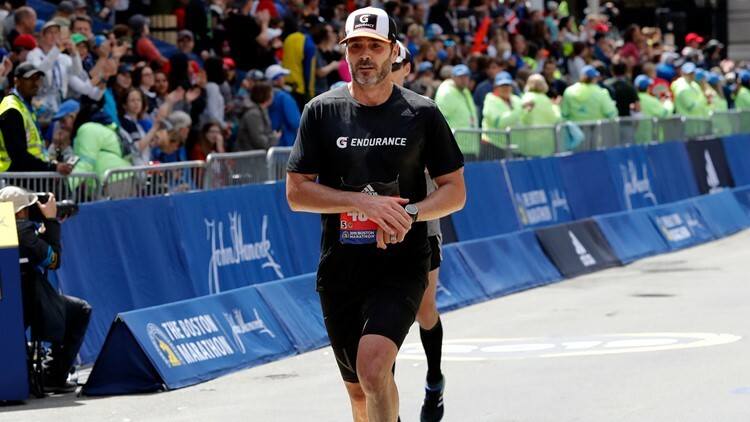 CHARLOTTE, N.C. — Seven-time NASCAR champion Jimmie Johnson completed the Boston Marathon Monday, finishing the 26.2-mile race in 3 hours, 9 minutes and 7 seconds. According to NBC Sports, Johnson's average time per mile was 7:13 and he placed 4,155th overall. He was 3,746th among men and 641st in his division. Johnson said his goal was to finish in less than three hours but wasn't sure he'd be able to complete the marathon at that pace. He tweeted that he slowed his pace to ensure he'd finish the course. "I left the pace I wanted to try to hold on and came up a little bit short of my goal," Johnson said. "I wanted to race it and really run hard and challenge myself. I need some food. I'm afraid to sit down, I might not get back up." Ally Bank, Johnson's sponsor in NASCAR, organized a large group to cheer him on at the 17-mile mark of the route. That encouragement helped boost one of NASCAR's best to the finish line. Johnson said his time qualified him for next year's marathon but he's unsure if NASCAR's schedule will allow him to race.